I'm typically wary of ethical/moral arguments against car culture. Certainly there is a personal responsibility argument to make against non-conscious automobility. 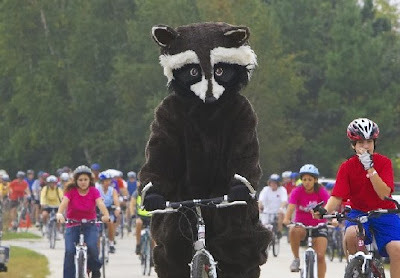 However, bicyclists win few friends with a self-righteous posture. Our project is to push public officials for more comprehensive, inclusive, sustainable, and community-centered transportation systems. We shouldn't simply be scolds. Most Americans don't wake up and say "I think I'll pollute the air, endanger children and seniors, deposit toxic residue, create noise, consume petroleum, contribute to global climate change..." No, most Americans wake up and say "I'm off to work." And thanks to decades of automobile-centric government policies, they have few reasonable choices but to drive. Transforming the priorities of transportation policy is our political project. This interview is provocative, without plunging into off-putting moralism. Cohen suggests that policy-makers have the primary ethical responsibility to favor community over private interests. And there's a great segment illustrating the rampant criminal abuse of public parking privileges by New York City officials. Henrietta, N.Y.--While most of us are seated behind the wheel, our foot alternating between the gas pedal and brakes as we contend with traffic on our way to work each morning and evening, Corey Brandes is pushing some different pedals. The physical education teacher at Roth Middle School in Henrietta and Rush resident takes in breath-taking views of the sunset and wildlife from the seat of his bike on the Lehigh Valley Trail. By road, Brandes’ commute is 12 miles round trip. By trail, it's more like 26. 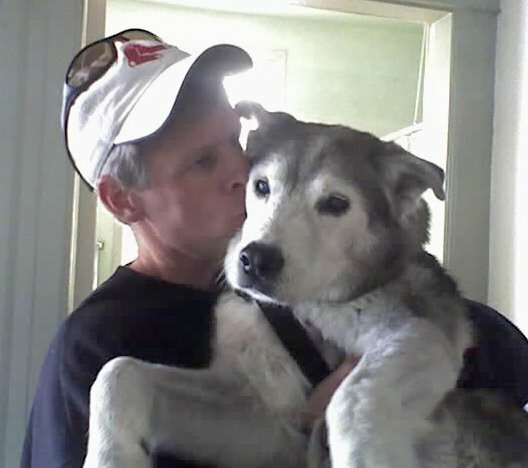 He estimates he has ridden more than 1,000 miles since Sept. 1. Brandes began commuting to work on a bike almost a year ago. "This summer we dropped from two cars to one, so there's no backing out now," he said. "Not that I would ever want to. It's a way for me to get exercise and work at the same time. It kills two birds with one stone." Inspiring story, featuring comments from Jason Crane of Rochester, NY, creator of the popular commuting site RocBike.com. (Employers) continually ask why they should participate and/or how can they participate in encouraging non-motorized transportation. There are multiple answers to this question. An answer to "why" is usually the first item on people's minds, and that is the bottom line. 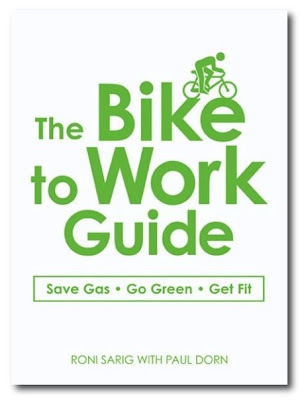 As a business, promoting bicycling and walking as part of your wellness efforts undoubtedly makes economic sense. Studies have shown that for every dollar spent on wellness programs, the average return on that investment is $3.84. Companies running effective wellness programs typically see reduced absenteeism, higher productivity, reduced health care costs, and have happier employees. All increase profits. Promoting bicycling and walking is an easy physical activity that can be incorporated as part of any wellness program. The health and wellness benefits are not the only items that affect an employer's profits. Providing automobile parking is expensive. Instead of building a new parking lot or refurbishing an old one, encouraging the use of a bicycle or feet to get to work is an economical alternative. Victoria Transport Policy Institute studies show that it costs about $1,500 per stall in a new surface parking lot and the annual maintenance cost is about $200 per stall. Image: Web capture. Presumably, this is a badger. Night Cycling: Is it safe? 1. Many nighttime cyclists are not properly lit. This ranges from cyclists who completely lack lights, to cyclists who are poorly lit, to those who are well lit, but the lighting arrangement is visually confusing. Interesting and timely blog post from Seattle, featuring charts of local collision reports. 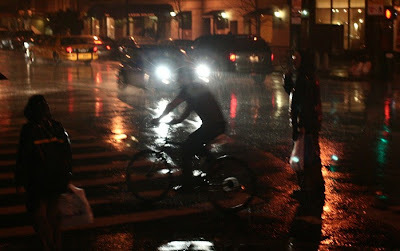 Darkness shouldn't discourage bicyclists. Thoughtful caution, responsible riding, and effective lighting make bicycling after dark possible and even enjoyable. Bicycle headlights have gotten significantly better: more affordable, more efficient, brighter. Urban planners are looking to enlist more mild-mannered Clark Kent-like bicycle commuters to help battle Dallas-Fort Worth's air-pollution and traffic congestion woes. They want more people to consider bicycle commuting for short distances, either directly to work or to link to mass transit. The enlistees need not be faster than a speeding bullet or more powerful than Lance Armstrong. 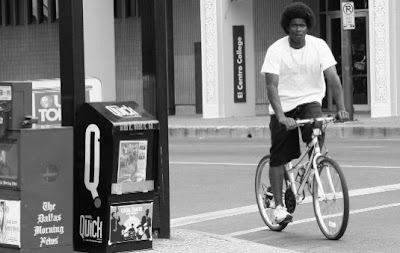 A great article from Dallas, a city that presently ranks in the bottom ten for bicycle commuting. The story includes comments on health improvement, trail development, and enhanced transit access. In my favorite television documentary program, King of the Hill--hey, it's about Texas, right?--the only characters who regularly bicycle are the youngsters Bobby and Joseph. Good luck to Dallas and my friends at the Texas Bicycle Coalition. Can bikes save the planet? If you missed it, Monday's Record Searchlight carried an Associated Press story...that has public health officials trying to link obesity rates in the United States and global warming. One scientist interviewed calculated that if every American between 10 and 74 walked a half-hour a day instead of driving, the annual U.S. emissions of carbon dioxide would be cut by 64 million tons. Some 6.5 billion gallons of gasoline would be saved...and people would shed more than 3 billion pounds. Interestingly enough, Trek recently rolled out a new campaign to get people riding called 1 World, 2 Wheels (www.1world2wheels.org). "The solution to some of the world's biggest problems is in your garage," the Trek literature said. The humble bicycle. Trek will commit about $1.6 million over the next three years to support the League of American Bicyclists' Bicycle Friendly Community program and to fund trail development with the International Mountain Biking Association. The goal is to increase trips taken in the U.S. by bicycle to 5 percent, from the current 1 percent by 2017. And with some 40 percent of all car trips taken in this country being less than 2 miles, it's an achievable goal. The directive, the hope of 1 World, 2 Wheels: If your destination is two miles or less, ride your bike. Great article from NorCal touting the health and environmental benefits of bicycling for transportation. Image: Web capture. 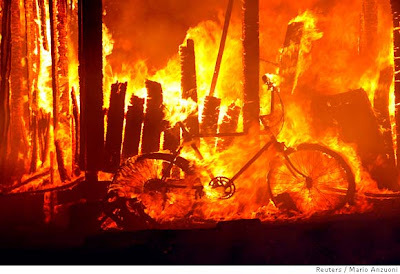 Bicycle burning in San Diego fires, October 2007, a conflagration made worse by sprawl and car-dependent development. Cyclists have long revered Portland for its bicycle-friendly culture and infrastructure, including the network of bike lanes that the city began planning in the early 1970s. Now, riders are helping the city build a cycling economy. There are, of course, huge national companies like Nike and Columbia Sportswear that have headquarters here and sell some cycling-related products, and there are well-known brands like Team Estrogen, which sells cycling clothing for women online from a Portland suburb. Yet in a city often uncomfortable with corporate gloss, what is most distinctive about the emerging cycling industry here is the growing number of smaller businesses, whether bike frame builders or clothing makers, that often extol recycling as much as cycling, sustainability as much as success. Interesting article and video by the nation's paper of record, on the burgeoning bicycle economy in Portland, Oregon. The city has long been hailed as a the country's leading bicycling-friendly community. And this growing bike culture is encouraging businesses that serve bicyclists. And the bike economy's employees become a political constituency. This photo presents a bike parking model I wish more cities would embrace: Removing car parking to create space for parked bikes. 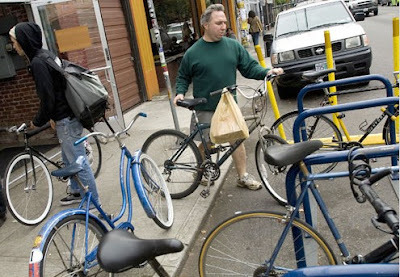 Don't force bicyclists and pedestrians into conflict by crowding sidewalks with bike racks. Get rid of the cars. I'm late reporting this significant article, see also the comments at BikePortland.org. And my friend Bob in Portland--taking time from his ceaseless search for Sasquatch--commented: "There's something happenin' here, what it is ain't exactly clear. There's a man on bike over there..... Critical Mass? Maybe, but perhaps it's just the realization that it's the twilight of the age of the automobile." My blogging was interrupted for a while, as my beloved Boston Red Sox rolled to their second World Series championship in four years, consuming all my leisure time. So upon returning to bicycle blogging activity, it makes sense to look at what residents of Beantown have been up to in terms of bicycling, now that Fenway Park occupies less of their attention. 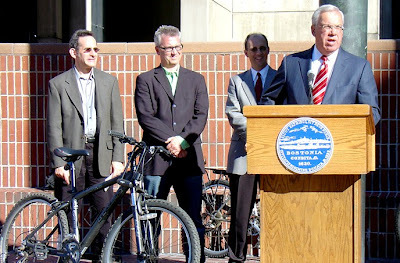 At the end of October, Boston Mayor Thomas Menino--a newly enthusiastic bicyclist--convened a four-day summit of bicycling experts, titled "Role of Bicycling in World Class Cities." The event at Boston City Hall attracted more than 100 participants, and is intended to launch Boston's efforts to improve bicycling conditions. The summit also attracted significant media coverage. According to Nick Jackson, who works for a Chicago-based bicycle and pedestrian advocacy firm, and was hired by LAB as a consultant for the conference, Boston has nowhere to go but up. "(Boston) has the distinction of consistently ranking as one of the worst big cities for bicycling in the country," he said. To coordinate its efforts, (Boston) also brought in Jeffrey Rosenblum, cofounder and executive director of the nonprofit Livable Streets Alliance, to serve as a consultant for the program. "I'm an advocate, so I'm not going to say that I totally trust everything that the city is going to do," he said. "But I feel that the level of collaboration and cooperation the city has shown since August has just been a completely refreshing breath of fresh air." Cities of Boston's size are good for cycling, said Andy Clarke, executive director of the Washington, D.C.-based League of American Bicyclists. "We're saying not to put on spandex and ride 50 miles, but just to ride two or three miles around their neighborhoods," he said. "Boston is an iconic American city with a very particular reputation for traffic issues—so to turn around a city like Boston is going to be a real challenge and a really strong message to others that it can be done,” Clarke said. Best wishes to Boston in its efforts to enhance bicycling. As I've said on this blog before, transforming the bicycling conditions in a community depends on grass roots activism by bicyclists. But having a supportive chief executive certainly helps.